a short blog on Ecstasy Film Inc., the production company and Ecstasy the film, based on the book by Irvine Welsh. Ecstasy Film Inc. now has a number of projects in development and in various stages of production. Toronto, ON, Wednesday, March 21, 2007 - The ever-so-controversial book Irvine Welsh book, ECSTASY, based on the reasons why people are compelled to take to drugs, turns its pages and gets ready to flip open onto the Big Screen. Toronto based, Rob Heydon, the creator of over 100 music videos and commercials around the world, will be directing ECSTASY. His work has been noticed by companies globally as he has done projects for corporations such as Volvo, Johnny Walker, BMG, Diesel, Burton, Molson, Jack Daniel's, and Airwalk. Mr. Heydon is widely recognized and has won prestigious awards including a Juno for Best Video for Edwin's "Alive" (Sony Music Canada). 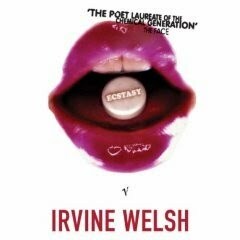 Mr. Irvine Welsh author of ECSTASY and Trainspotting says, "I've met Rob Heydon and he's a brilliant young producer/director with a good head on his shoulders and knows what he is doing. That's quite rare in the film business”. Shooting will take place in Scotland. ECSTASY is a dark romantic comedy based on the book, ECSTASY: Three Tales of Chemical Romance, written by Scotsman Irvine Welsh. ECSTASY has been translated into 20 languages and was a number one bestseller in over 20 countries. Mr. Welsh's first book, "Trainspotting", published in 1993, and was voted by Waterston’s, Europe's largest bookstore chain, as one of the Ten Best Books of the Century, selling over one million copies in the UK alone, and has its own cinematic Cinderella success story. Danielle Iversen, Publicist, that PR thing inc.
Ecstasy is a dark romantic comedy, set in Scotland, and Amsterdam. It is based on the controversial book, Ecstasy (a collection of three short stories) by Irvine Welsh, which was first published in 1996. It was a No. 1 Bestseller in the first week of publication, and has been translated into over 20 different languages. The last short story, The Undefeated, was adapted into the play Ecstasy (by Montreal-based Keith Wyatt) that performed to sold-out audiences and critical acclaim across Canada and at the Fringe Festival in Edinburgh. After seeing the play, Irvine called it the “best adaptation" of his work. The producers attended the Winter Music Conference in Miami, Florida, near the end of March which enabled us to meet with Artists, get them excited about the project, and discuss their possible involvement and contribution to the soundtrack, an essential aspect of Ecstasy’s success. In January, Spin Magazine threw a party at Sundance called SPINdance. The wanted a film to promote that fit with the magazine and the independent spirit of Sundance. Ecstasy was a perfect fit, so we worked together and has Paul Oakenfold DJ the party. All the US and UK press, film critics and film writers were invited attend a dinner prepared by a celebrity chef. Mickey Cottrell an LA based publicist organized the press and we had the opportunity to make our initial contact with the press. They were all enthusiastic to hear about the future of another Irvine Welsh film. We feel that this will be a great life-affirming love story that celebrates the redeeming qualities of a human spirit as it travels down the road to sobriety, surrounded on all sides by the controversial landscape of Ecstasy, temptation and escape. I really can't wait for this movie to come out. It's about time for a new Welsh movie and I can't think of a better book to base it from. Thank you so much!